Please Note: Jordan's Home Furnishings serves the New Minas, Halifax, and Canning, Nova Scotia area. Please contact us for delivery and price information. The modern style - with its clean, abstract forms - belongs to no one country, owes its origin to no one person. It became a universal style, growing out of an international movement back in the days of World War One. Artisans from around the globe were using new materials and new technology to express a "less is more" philosophy in art, architecture, product design and certainly furniture. Our Manhattan Collection shares this approach in it's clean lines, bold red/brown Cabernet finish and Park Avenue finish and contrasting brushed nickel hardware. You'll find larger scaled cabinets, wider thicker head and footboards, and bedrails that surround and float the bedding. 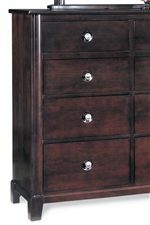 The most distinct styling detail is the concave curved design found on the cabinet side posts, on beds in their framed panels and curved slats, and behind many of the drawer pulls. It adds a subtle rounded feel to each application yet conforms to the classic straight lines of the overall design. The scale and proportions are right in tune with today's homes. And so is the smart look of this dark cherry finish. Browse through the collection and make note of design details and construction features. And notice that the design is right at home in a variety of decor themes... not just contemporary but in high fashion traditional settings as well. Browse other items in the Manhattan collection from Jordan's Home Furnishings in the New Minas, Halifax, and Canning, Nova Scotia area. 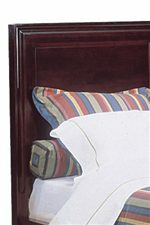 Rounded Arch on Slatted Headboard. 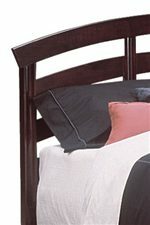 Paneled Headboard with Clean and Smooth Lines. Clean and Simple Lines Create a Contemporary Look.